The house and land at 254 Hawken Drive, at the corner of Hawken Drive and Boomerang Road West, St Lucia, Brisbane is my home that is still beneficially owned by me. 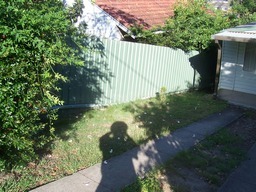 These are photos of the subject property. Corrupt Chief Justice Paul de Jersey's Anglican Diocese of Brisbane owned the house at 256 Hawken Drive, St Lucia. This adjoined my home, [which I still beneficially own]. [My home has the tiled roof in the top of the photo.] The Anglican Diocese of Brisbane owns the house at 256 Hawken Drive, St Lucia as part of the Monopoly Board game fetish of ARMED ROBBER the Reverend Professor Dr John Leslie Morgan, Warden of St Johns College, at The UNIVERSITY of QUEENSLAND. Morgan calls this "Barrett House" and charges students [including females], who apply to be residents of St Johns College on the St Lucia Campus of The University of Queensland, the same fees for residents as though they were on Campus with the added PROTECTION, SAFETY and other benefits of being on campus which is patrolled constantly by University Security. Morgan decided he wanted to acquire my property. I was there for the long term, for my retirement. I decided I wanted to upgrade my property. I also advised Morgan that on the highest part of my yard, that consequently received the most sunshine, I intended to cultivate a fruit and vegetable garden. This was the reason I wanted a chain wire fence, as the sun shone from across his yard into my yard. See the photo below. You will see [from the details of this photo recorded by the camera], that this photo was taken at 7:03AM on 22/11/2006. The sun is behind me. [Note the direction of my shadow.] The sun is in a vertical plane at right angles to the colorbond on the fence,[description by a mathematician] at about 2pm of a day. The sun rises up from behind me and passes via my right in a plane at an elevation of about 45degrees from the horizontal [another description by a mathematician]. You can therefore comprehend that this fence has the effect of greatly reducing the amount of sunshine into that part of my yard. This is obviously worse in winter, when the sun is lower in the sky and so the shadow of Morgan's fence is longest into my yard. He obstructed the sun into my yard without any discussion with me, just to spite me. I TOLD HIM WHEN THE FENCE WAS TO BE BUILT THAT I WANTED CHAIN WIRE TO PERMIT THE SUN INTO THE ONLY PART OF MY YARD WHERE THE SUN SHINES AND that LAND-CARE and RE-HABILITATION of MY YARD WAS MOST IMPORTANT TO ME. He did it because it was on his side of the fence and he could do it. He did it because he is a bully. He did it to ruin the only place in my yard where I could grow a garden. Unknown to me at that time, my low life PTSD nut case brother in law Hugh McVean, who was trustee of my home, had entered into a contract with the Corrupt Anglican Diocese of Brisbane with its Chancellor, the corrupt Chief Justice Paul de Jersey, so the ARMED ROBBER the Reverend Professor Dr John Leslie Morgan, Warden of St Johns College, at The UNIVERSITY of QUEENSLAND could give vent to his Monopoly Board game fetish of acquiring property and money.